Every company and organization nowadays require an online web portal as most people in our technologically advanced world rely on the Internet for almost all information they need. For businesses, a great website is an essential part of an effective marketing strategy and can be a major tool for driving more sales into your businesses. Other institutions, such as education departments, can make use of this game plan in order to draw potential students into their programs outline and course offerings. 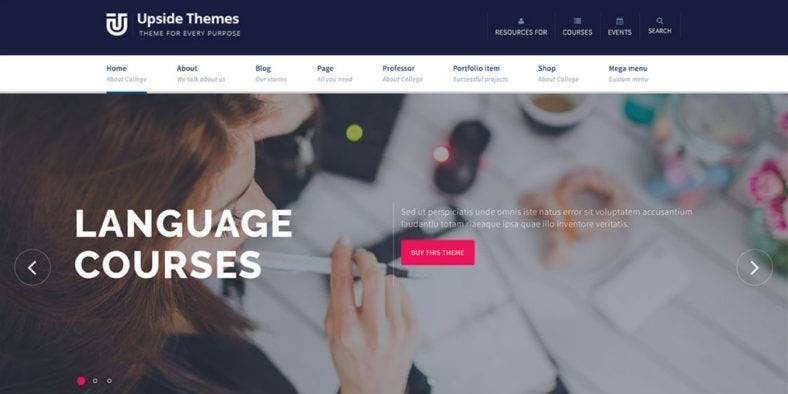 Check out our impressive collection of the best Drupal website themes and templates for training and education, which include templates for universities, colleges, kindergartens, and high schools websites, among others. Drupal is one of the best web design platforms out there, with its robust functionalities and tons of powerful features, guaranteed to cater to your every training and education website‘s need. So, go ahead and find the perfect template just for you. First of all, here is Education Plus, a Drupal education theme and private teacher power point template with a clean and modern design. Its polygon backgrounds, parallelogram-shaped images, and round-edged ghost buttons provide interesting touches over a simple and minimal layout. It also features a full-width image slider in the background to further enhance the theme’s visuals. Built on the Drupal platform, it includes state-of-the-art features such as a fully responsive and retina-ready layout which allows your website to adjust to any screen size and resolution. Moreover, this template is highly customizable with Google Web Fonts, sliced PSD layers, and a number of customized Drupal modules included in the package. This multipurpose website template for Drupal presents a clean and minimal design with a wide range of options which are composed of over 10 pre-defined home page layouts that are all highly customizable to let you create your own custom web pages. Universh also comes with 10+ ready-made headers, 10 menu styles, 7+ stunning footer variants, and so much more. 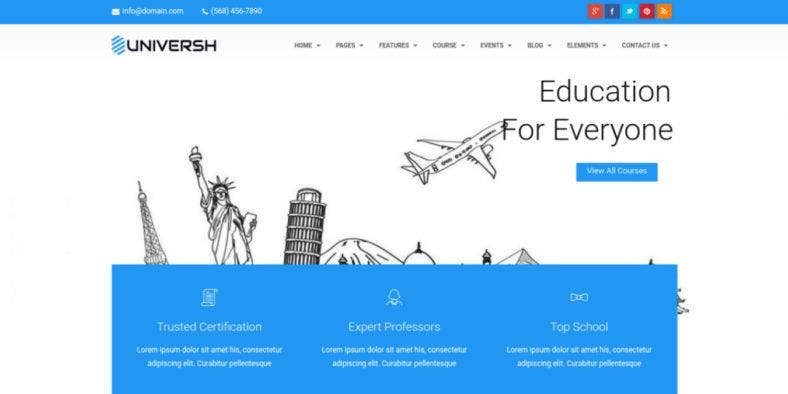 Probably the most powerful education website WP template, it includes tons of features and elements that will let you build a dynamic and highly functional website for your businesses, institutions, and establishments of any kind. Aside from the features already mentioned, it also boasts of a responsive, SEO-ready, cross-browser compatible design. 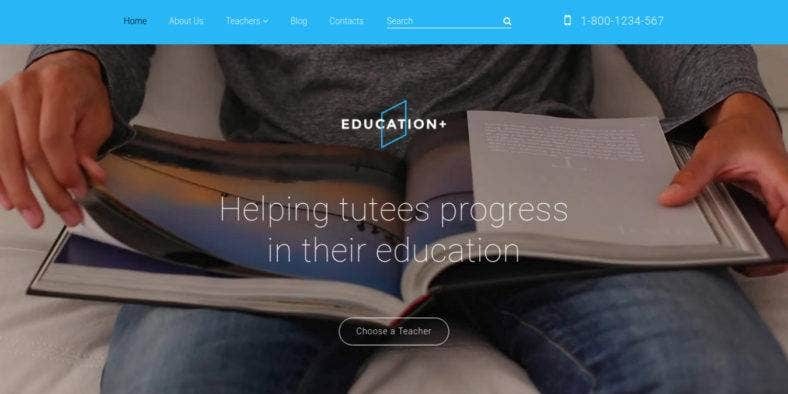 Speaking of private teachers, the next Drupal website template is especially developed to provide private tutors and individual instructors a way to showcase their capabilities and services to potential clients online. Tutoring is a dynamic PHP template with a simple design and clean layout but with sophisticated functionalities thanks to its many features. Among these features is the theme’s highly responsive design with an easy-to-navigate layout provided by a drop-down menu, back-to-top button, and live search. It also boasts of a professional-looking visual aesthetic with gorgeous typography from the Google Web Fonts and Favicon web icons included in the package. It also has social options for better media reach. The perfect solution for websites that wish to showcase their courses and offerings online is Educar. This powerful and responsive Drupal theme for business and education websites alike comes with five various homepage layout demos for different types of educational establishments as it matches your needs and preferences, together with a bunch of great features. Developed on the Bootstrap framework, it features a drag-and-drop page builder with panels, with six color schemes and unlimited color skins for easy customization. It also comes with a printable menu template, various post formats support, forum and poll support, a working PHP contact form, high-quality images, parallax effects, gorgeous animations, elegant typography font, etc. 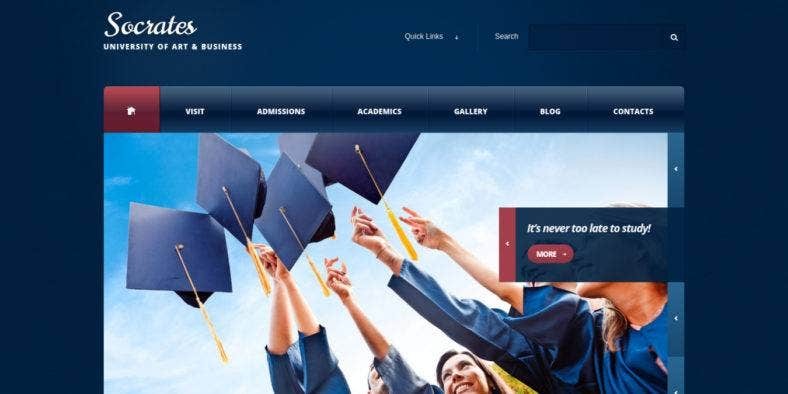 Then, we have this college and university Drupal template with an ultra-modern and extremely unique design perfect for national universities themes and state college themes. 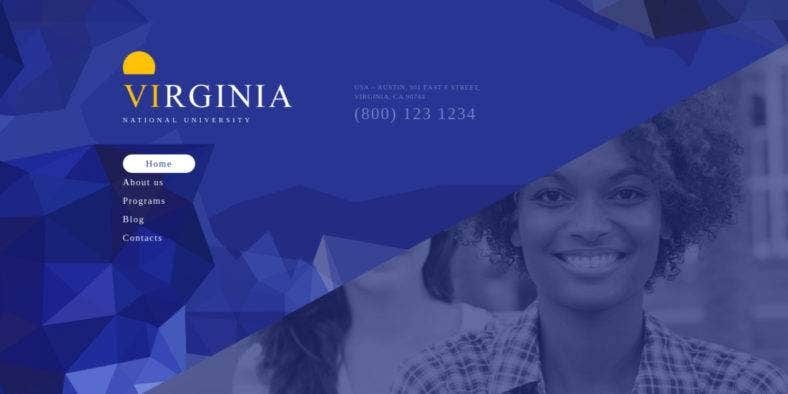 Virginia is an effective web promotion tool for any education institution with white and purple tones over a unique layout with the non-standard positioning of elements on the top of the page. Aside from that, the theme also boasts of a responsive layout which allows your website to display well on any device as well as an SEO-friendly design that enables your web pages to rank high on search engines. With intuitive admin panel themes, advanced theme options, and a bunch of Drupal Social Networking modules, customizing this theme to fit your style is effortless. And then, we have Aquarius. 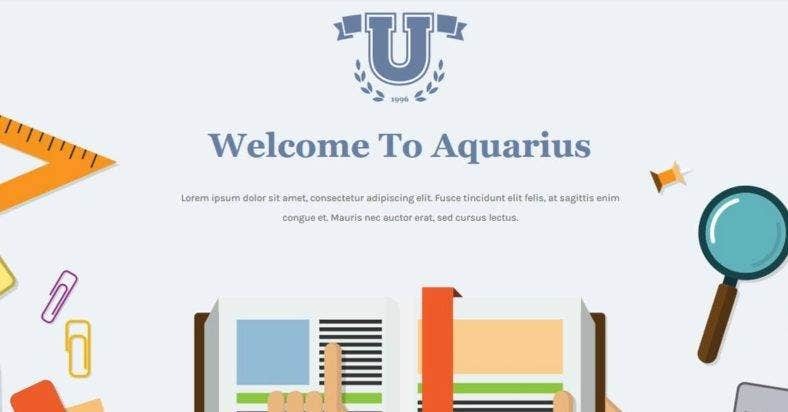 A professional and educational university Drupal themes & templates with a trendy and clean design suitable for many educational institutions like universities and colleges as well as related contents such as courses and events. It can also be used for a variety of similar niche websites thanks to its easy customizability and robust functionality. A premium one-page Drupal theme, it comes with 4 homepage demo layouts to choose from, with custom content types like galleries, courses, teams, portfolio covers, and events, among others. It also supports post formats for high-quality images, videos, and audio, along with a drag-and-drop block builder, a powerful grid system, unlimited color skins, and more. 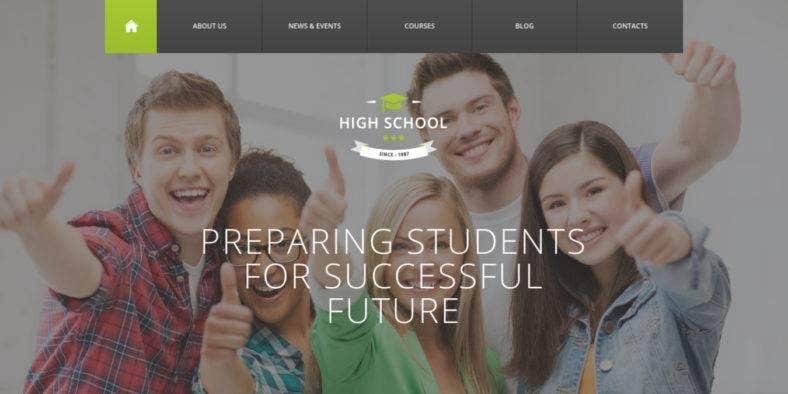 A responsive Drupal template for education, High School is a neat and innovative free website theme that has everything you need to run an online school portal. It has a clean and modern layout that is fully responsive, so it adjusts its display size on any mobile and desktop device with various screen sizes. It is also cross-browser compatible, so it works well with all major browsers. Additionally, the theme features a full-screen free background image to create an eye-catching visual along with the layout’s parallax and lazy load effects as well as a bunch of HTML plus JS animations. To customize the cool website theme and personalize its elements, the template includes advanced theme options and a powerful admin panel theme where you can manage your website. Next is Coursat, a multipurpose Drupal theme for education with a clean and modern design perfect for any course, workshop, lesson, training, and other types of educational websites. It offers a quality premium learning management system with over 10 homepage layouts plus eight-course pages, along with awesome pages for the Blog, About, Services, and Contact sections. Built with Drupal’s latest version, the Bootstrap Grid website, and HTML3/CSS3 technologies, the theme comes with lots of cool features such as the fully responsive design, retina-ready display, MD Slider, Mega Menu, Awesome icon fonts, Google web fonts, unlimited color choices, detailed documentation, and more beginner-friendly options. 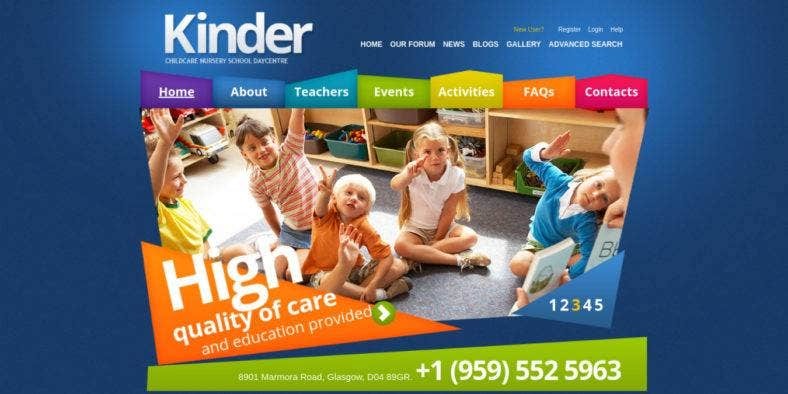 Kinder is a fun and creative Drupal template built specifically for primary and nursery schools, childcare and day care centers, kindergartens, and other kids website themes. To attract youngsters and parents alike to your school services, this theme comes with a bold and bright color scheme with geometric patterns that are reminiscent of a children’s playground. With an appearance different from most templates, the theme does not shy away from cool and awesome features as well. Starting with the responsive layout, it is also quite easy to customize the pages with various color themes and the availability of hundreds of Google Web Fonts ad Favicon icons. It also includes web forms like the Contact and Login form. 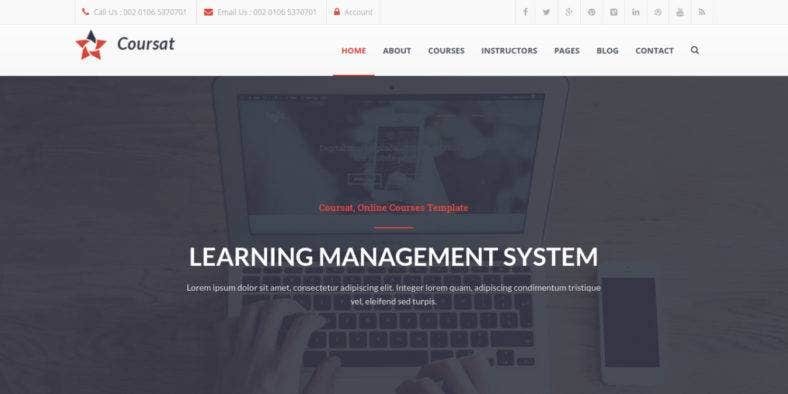 On the other hand, Edubiz is another powerful education and course template from free Drupal themes that comes with a clean and modern design integrated with six available home page options to choose from. Built with Gavias Block Builder, you will be able to build professional web pages and block sections easily through an amazing drag-and-drop functionality. This responsive parallax website theme also includes features such as slider layers, full-screen images, unlimited color skins, elegant typography, and stunning animations that help boost your website’s visual appeal. Powered with the latest web design technologies comprised of multipurpose Bootstrap websites, HTML5, and CSS3, the theme is easy to use and customize. This responsive university and school website theme has a clean and modern design with well-organized sections, beautiful typography effects, and tons of white space to highlight your website content more. Smart is packed with a bunch of cool features which includes tons of Drupal modules that you can use to customize the theme according to your preferences and needs. It also comes with features that enhance your website’s functionality and usability like the drop-down menu design and a back-to-top rounded button for easy navigation, sliced PSD and advanced theme options for effortless customization, an easy-to-use admin panel for website management, and so much more. It also supports video integration for more dynamic web content. Similarly, Upside is a modern and professional education Drupal template particularly created for educational establishments like universities, colleges, schools, e-learning portals, and training centers. This fully responsive website theme also comes with special content types for courses, events, staff, and faculty management, along with many other useful features. In addition, the template includes Drupal modules such as Views, Panel schedule Everywhere, TB MegaMenu, Field Collection, Bean, and Panels 3 Module, which is based on a drag-and-drop page builder interface that lets you build a customized layout for various purposes. Aside from these, the theme is retina-ready, SEO optimized, and cross-browser compatible. 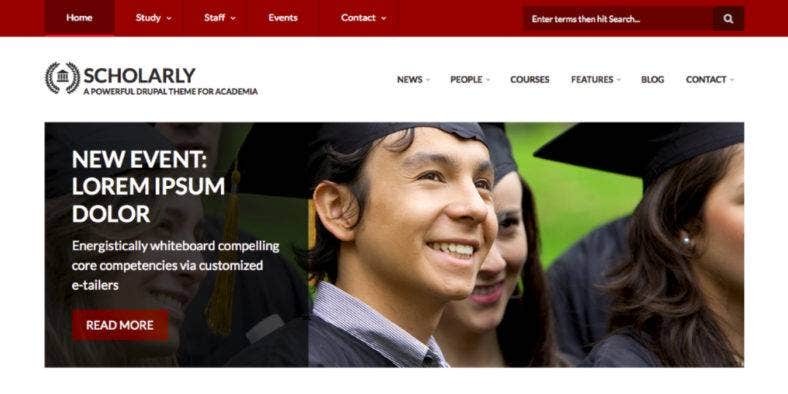 Another creative Drupal website theme for universities and colleges is Socrates. The theme is characterized with a blocked layout and a deep dark blue color palette which exudes wisdom and knowledge perfectly representing the learning institution. Not only does it give off an intelligent vibe, but it also creates a great contrast which makes the design look elegant. The theme also includes a number of robust features such its responsive layout with a drop-down menu, back-to-top button, a commenting system, live search, social options, Google web fonts, Google map, search engine optimization, and cross-browser compatibility, among others. It is also packed with customized Drupal modules and a vigorous admin panel. Why Use a Drupal Template? The Drupal platform is one of the most powerful and dynamic web design technologies nowadays. It is one of the best content management systems with a wide array of features, a large collection of modules, and hundreds of options to choose from in order to create the perfect website that you have been dreaming of for your business or organization. There are a lot of benefits that you can gain from using a Drupal template as listed below. Drupal is an open-source software. Unlike other popular content management systems, Drupal’s core software, modules, and templates are contributed by professionals and can be used for free; therefore, it reduces your cost in web development. Drupal is highly customizable. It provides loads of choices and options in terms of features, functionalities, layouts, and designs, which allows website owners and web designers to address the various needs of businesses and organizations. Drupal is an enterprise software. Drupal developers can easily integrate it with other applications as it boasts of its extreme scalability, flexibility, reliability, manageability, security, interoperability, and availability of resources. Drupal has extensive API support. Social media platforms such as Facebook, Twitter, YouTube, etc. as well as SEO platforms like Google Analytics give Drupal extensive API support, so you can perform your digital marketing strategies. Drupal is optimized for SEO. Speaking of online marketing strategies, the Drupal platform, along with its themes and templates, has a great ability to display your website content in a way the search engines like and rank them higher among your rivals. Drupal is mobile-ready. Paired with the Bootstrap framework and other latest web design trends, a Drupal theme always comes with a fully responsive, retina-ready, and cross-browser compatible design which helps you generate more leads and attract a greater audience. Drupal lets you create a stunning website. Like all the benefits mentioned before this, Drupal enables you to build a feature-rich, high-quality website with functionalities that cater to all your business needs and a design that suits your taste and style. 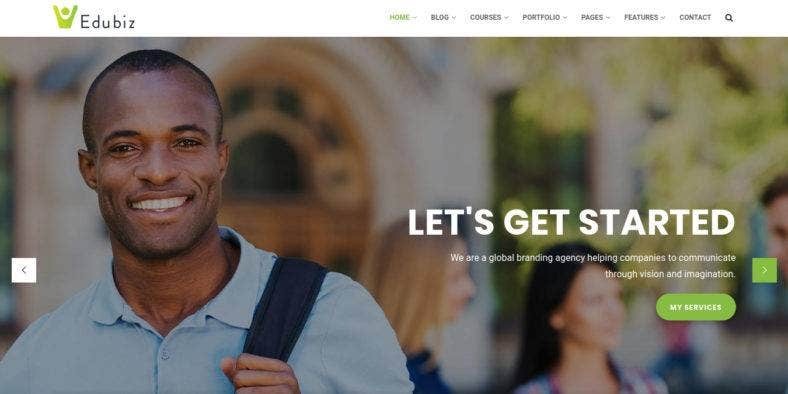 A state-of-the-art university website template, University comes with a neat and subtle look thanks to it neutral color scheme and simple boxed layout. Its contemporary design and technical approach perfectly suit websites of any learning institutions, along with some trendy elements like the slider with high-resolution images, a three-part content area, and more. Among this elegant and modern Drupal theme‘s other features are its intuitive navigation system with a drop-down menu and search bar, social media integration with several social media buttons, a fully responsive design which makes it easy to interact with users on mobile devices, a secure payment scheme, and quick availability of codes for easy customization. Another education website template built with Drupal for universities and other educational establishments, TB University is a fully responsive website template that comes with a modern and clean design. Unlike any regular templates, it features exclusive content types and pages dedicated for students, courses, professors, and events, among others. The theme also comes with a bunch of cool features such as a smooth and eye-catching slideshow, eight color styles, and other classic Drupal features. It also includes some useful third-party modules like the Youtube field, Superfish menu, Breadcrumb navigation, jCarousel slider, Web form, Calendar blog, Quicktabs, Colorbox, and others. The clean and minimalist Drupal theme you see above is for online school websites which are quite popular nowadays. These websites typically offer classes on subjects such as foreign languages and business. 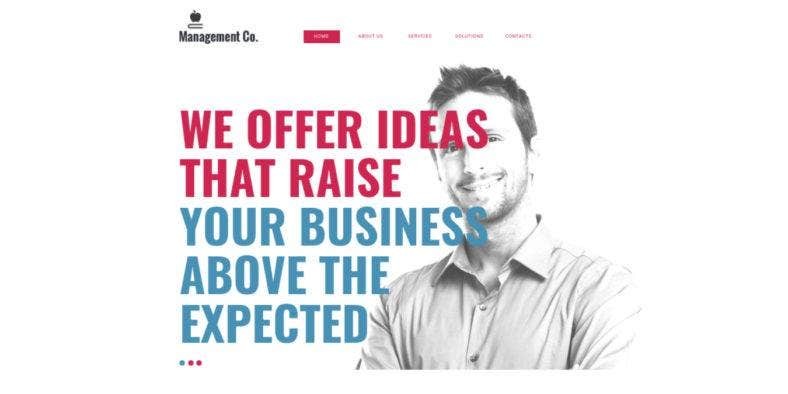 Management Co. has a clean layout with lots of white space to direct the focus of your viewers’ attention to the content of your website, along with the large and bright-colored typography. It also features a large image background for the text slider where you can showcase images that represent each of your services. Moreover, the theme’s modern responsive design make sure that your premium school website adapts well to any device it is viewed on, together with parallax and lazy load effects as well as stunning HTML plus JS animations to boosts your site’s appearance. 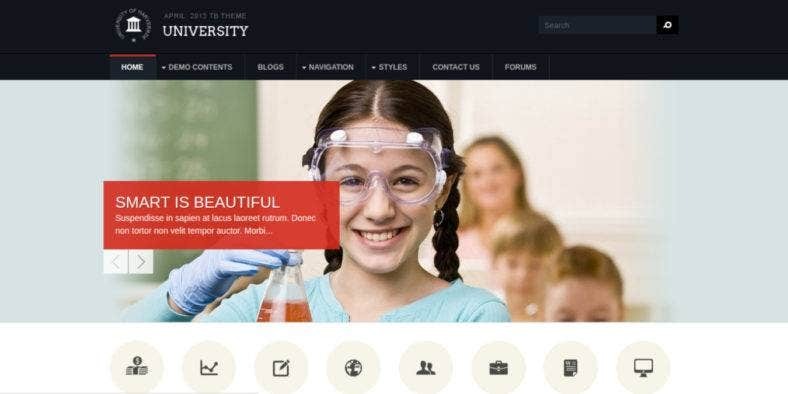 Scholarly is a powerful Drupal template perfect for setting up your academic blog themes as it boasts of content types for faculty, students, courses, and events. Based on the latest Bootstrap framework, it showcases a classic yet modern design that is rich in features, providing a great combination of beautiful aesthetics and exceptional functionality. This stunning Drupal theme is ideal for universities, schools, academic departments, and such. It features special content types such as blog entries, testimonials, and web forms—each of which is equipped with fields based on real-life needs and experiences. Furthermore, it also has directory pages for courses, faculty, and students, among other features. 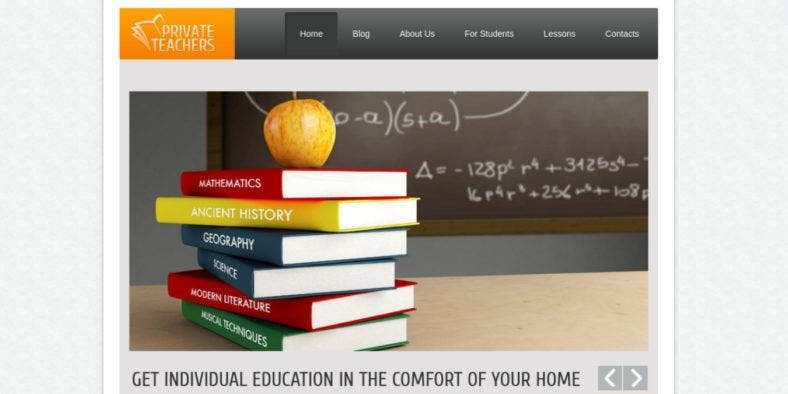 Next is Private Teachers, a simple but modern education and teachers website theme made from Drupal that can be used to market your private tutoring or special skills training services. With a fully responsive design and a boxed one-page layout, you will be able to present essential details and relevant information in a concise and compact manner. Also, the template boasts a wide array of features like the sliced PSD layers and valid coding for easy customization, a collection of Google web fonts and Favicon icons for beautiful typography, a drop-down menu and back-to-top button for easy navigation, a working contact form and social options for social networking modules, and many others. Last but definitely not the least, here is a driving school website template and management Drupal theme called Driveme. Especially created for driving school websites and other educational institutions and skills training centers, the theme comes packed with a bunch of amazing features which allows easy customization and effective content organization. It features multiple course pages, blog layouts, advanced booking forms, and more, along with three homepage variations; two header styles; two slider designs; unique payment options; three working booking, contact, and quote forms; and so much more. It is fully responsive, Drupal standards compliant, and uses jQuery and AJAX technologies for a flawless performance. Having a professionally-designed website for your schools and training centers can help introduce your establishments to a wider audience and provide information about the many services you are offering. It is a great way to stand out from competitors and other learning institutions while incoming learners are looking for the one that shares their vision and could provide them with the best training and education that they need. In order to build a perfect website for these purposes, you have to make sure that they have the latest web design trends and industry standards in order to attract the eye and interest of your target market. For more ideas and inspiration, you can also take a look and check out our extensive list of the best corporate and business Drupal themes and templates in the market today. And while you’re here, you can also take a tour and discover other website templates available for you to use.